On August 14 the Russian media appeared to focus on two major resignations in the leadership of the self-proclaimed republics of south-eastern Ukraine. First the resignation of Valery Bolotov, Prime Minister of the Lugansk People's Republic (LPR), was announced, followed a few hours later by reports that Igor Strelkov, Defense Minister of the Donetsk People's Republic (DPR), is also leaving his post. Commenting on the departure of Bolotov, online newspaper Gazeta.ru quotes militiaman and DPR coordinator for "unhumanitarian aid" Alexander Zhuchkovsky. Recognizing Bolotov's achievements in the coordination of the initial creation of the LPR, the newspaper's journalist argues that lately Bolotov's policy had proved inefficient. According to the author the man was not very popular among the militiamen and had a tendency to abuse alcohol. 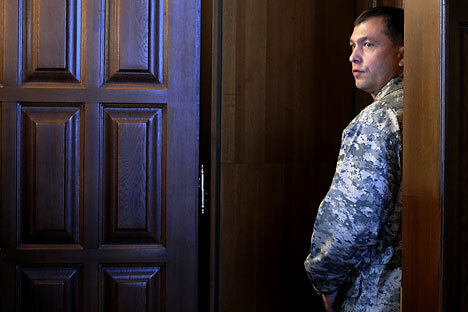 Commenting on his own resignation, Bolotov stated that it was impossible to continue working due to the wound he received during combat last spring. Press Digest: Kiev readies sanctions against Russia but is gas ban a bluff? Igor Strelkov's resignation was even more sensational, since he was one of the most famous southeast commanders fighting against the Ukrainian army. Just like Bolotov, Strelkov has been an important presence since war in the Donbass region erupted, but he was an even more significant figure, and perhaps the most popular leader of Novorossiya. A day before his announcement there was information that the DPR Defense Minister was "heavily wounded", something that was later denied by the republic's official representatives. Searching for possible motives for Strelkov's resignation, Gazeta.ru suggests that the popular leader was disadvantageous for Moscow, which has a big influence on the militiamen in southeastern Ukraine. "He was too ideological, non-political and difficult when it came to making agreements, in the good sense of course. That is, neither the Kremlin, nor Kiev, nor anyone could agree with him about conceding certain positions,"Gazeta.ru quotes Zhuchkovsky saying. According to the newspaper's journalists, it was precisely Strelkov's disloyalty to the Russian leadership and his complete intransigence that led to his resignation. The authors also believe that the changes in the leadership of the unrecognized republics can strengthen the position of influential Donetsk oligarch Rinat Akhmetov. Special correspondent from Expert magazine Gevorg Mirzyan sheds light on Akhmetov's possible role in the events. "It is known that the DPR and LPR project was initially created by Akhmetov (and not by Russia, as the Ukrainian government asserts)," writes Mirzyan. However, according to the author, the project later got out of control due to the radicalization brought about by the appearance of leaders that were independent from Akhmetov, including Strelkov. The removal of the DPR and LPR leaders from power may signal that Akhmetov is trying to bring the project back under his control, something that would also be in the interests of Moscow. "Both Akhmetov and Russia support Ukraine's territorial integrity with post-Crimea borders and a federal government that would guarantee the influence of pro-Russian regions and elites on the country's decision making process." However, if the DPR and LPR resist, and their new leadership will have Moscow's trust, the situation in Donbass may become more favorable for Russian interests," the author concludes. The newspaper Vzglyad has a different opinion on the personnel changes in Donbass. Citing the Russian political analyst Sergei Markov, it writes that "[i]t is possible that this may be leading to some kind of political recognition of DPR and LPR. Moscow must do what was done with the Palestinian Liberation Organization: it was recognized as the authorized representative of the Palestinian people." Markov believes that switching from foreign to local personnel (Strelkov is a Russian citizen and not a citizen of Donbass), caould encourage such a development in events. Meanwhile, the newspaper Kommersant writes that major progress has been made in the attempts to deliver humanitarian aid from Russia to Donbass: a cargo will be brought to Lugansk through the Donetsk-Izvarino border checkpoint, as well as to the territory that is controlled by the militias. Now it must be examined by Ukrainian border guards and the Red Cross and then, and most importantly, be safely delivered to the region, where recently fighting has become more intense. The director of the humanitarian convoy told Kommersant that it's most likely that the cargo will be examined and cleared at the Donetsk border checkpoint by Ukrainian border guards and customs agents, as well as by the International Committee of the Red Cross.